The poblano, like the jalapeño, is a chili with a famous flip-side. Their dried versions are so popular, in fact, that they have their own names: the chipotle (jalapeño) and the ancho pepper (poblano). How famous is the ancho? It’s part of what many call “the holy trinity” of dried Mexican peppers – all musts for making authentic Mexican cuisine, especially mole sauces. The ancho is mild and flavorful, and as it’s dried, it lasts a whole long time in the cupboard, making it an easy chili to keep around the kitchen. 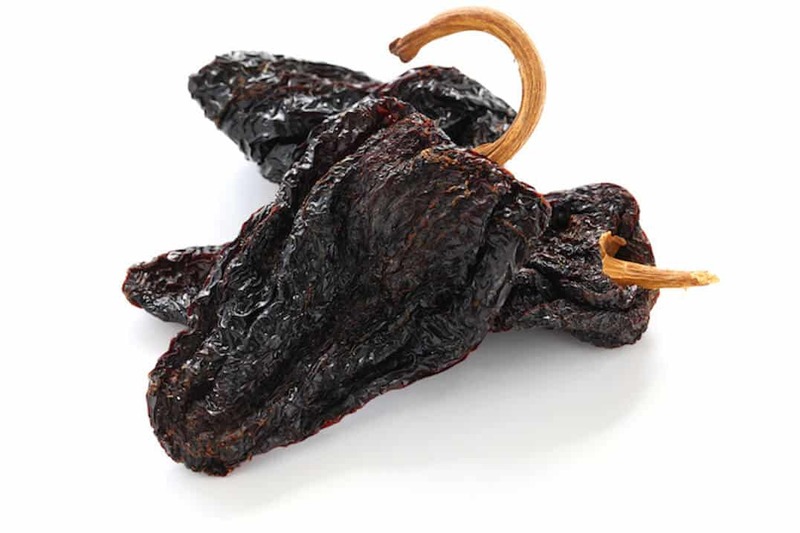 Simply an ancho pepper is a dried poblano pepper. The poblano is allowed to age on the vine to a mature red color before picking and drying. There is some confusion with the ancho and the two other dried chili varieties that make up a version of the Mexican holy trinity – the mulato and pasilla peppers. The pasilla is really the dried chilaca pepper, though you’ll often see ancho peppers mislabeled as pasillas. It’s somewhat easy to tell the difference once you see the two next to each other. Pasilla peppers are long like ancho peppers. Ancho chilies have a wider body (ancho does mean wide in Spanish). It’s a little more complex with the mulato pepper. The mulato is technically also a dried poblano, but it comes from a slightly different variety of poblano. They are very close cousins. The mulato also is allowed to ripen on the vine beyond the mature red to a near brown hue, giving them an even richer and sweeter taste. Hot hot is an ancho pepper? As anchos are poblano peppers, they share the same range of mild heat: 1,000 to 1,500 Scoville heat units. This puts it about two to eight time milder than a jalapeño. Though, expect the ancho to tend towards the hotter end of that spectrum. As chilies age on the vine, their level of capsaicin increases which is the chemical behind the chili’s heat. Since anchos are dried at a more mature age, they pack more punch than a younger green poblano. What does the ancho look like and taste like? Think of a giant raisin. That’s what the ancho closely resembles and even tastes a bit like too. Its skin is wrinkled and dark reddish-brown in color. The chili itself is around four to six inches long, and, as mentioned, it’s wide. 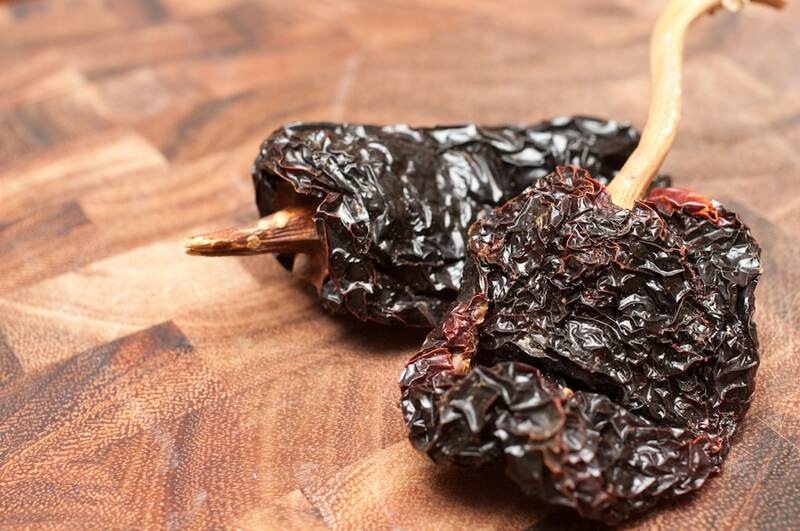 The poblano is one of the biggest chilies around, so the ancho follows suit. The taste is somewhat smoky and sweet. Along with an earthy pepper taste, there are hints of raisin and coffee. The heat slightly simmers; it doesn’t slap. So this is a pepper that many can enjoy. What can you cook with ancho chilies? The ancho is very versatile. First, you can rehydrate them by soaking the anchos in water for half an hour. From there, you can use them in all sorts of authentic Mexican recipes and sauces. This chili is a staple in mole sauces and enchilada sauces. It’s also a terrific pepper for mild hot sauces, hot pepper jellies, and chili pastes. You can also crush ancho into ancho powder to flavor all sorts of dishes. It’s a terrific substitute for generic chili powder (sweeter and typically milder). 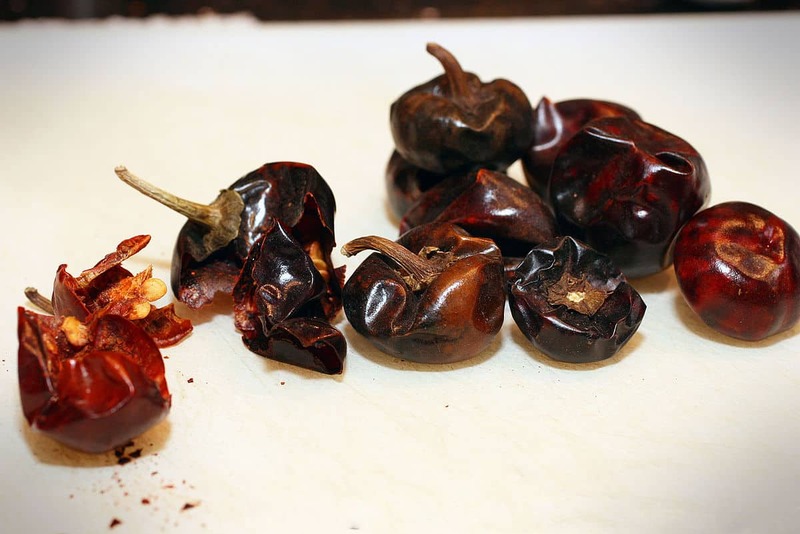 Because they are dried, ancho peppers can last for a long time in a cupboard. As long as they are in an air-tight container, expect them to keep for a year. Where can you buy ancho peppers? Once tough to find, anchos are now available in many supermarkets – both in dried chili form and as ancho powder. 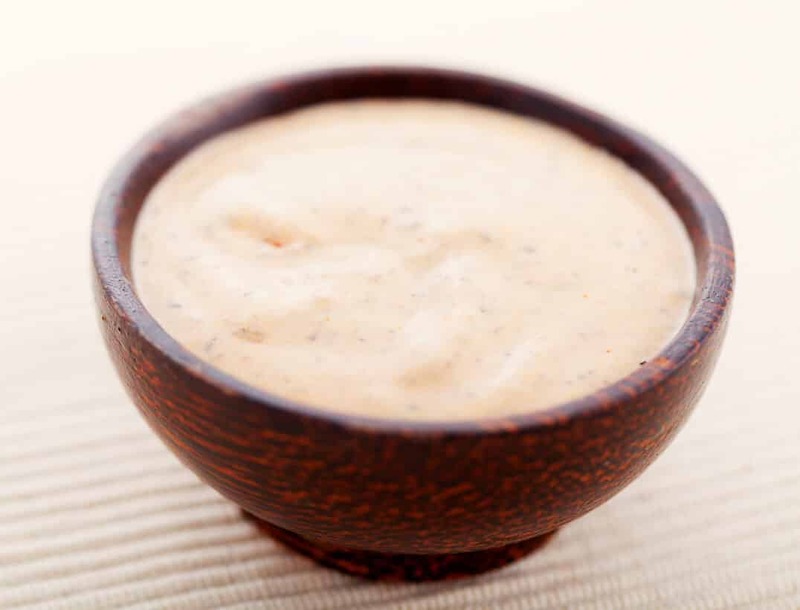 You can also purchase them in bulk online, as well as multiple powders, ancho pastes and jams. The ancho pepper is a must-know for authentic Mexican food, so if you enjoy experimenting with cuisines, getting to know the ancho is a must. This is a chili that’s both family-friendly and very flavorful. And since it lasts so long, it’s an excellent chili to always keep in stock in the kitchen.